Located in the historic Village of Tesuque, this stunning adobe, Northern New Mexico, pitched roof home overlooks the Sangre de Cristo Mountain and the northern badlands. Constructed by McDowell Construction, attention to detail is seen throughout the home. The home has three bedrooms, four bathrooms, formal living and dining room, large country kitchen and separate office, which could also be used as a fourth bedroom. Interior finishes include custom plastered walls with traditional colored faux finished, wood flooring, hand-forged door hardware, top of the line appliances, European style bathroom fixtures and hardware, and top of the line stereo and sound systems. The spacious country kitchen has a large breakfast are and family room with a shepherd's fireplace, all surrounded by large, double hung windows. The kitchen tile, custom cabinetry, walls and ceiling finishes have been impeccably presented, yet not disturbing the old world charm. The bedrooms, on the upper level, have dormer windows, that enhance the wonderful vistas, and are accented with window seats/beds/nooks. The deep portal that surrounds the house is perfect for outdoor dining, entertaining, or simply relaxing and taking an afternoon nap. The home has incredible, vivid native landscaping, arroyos filled with interesting and beautiful vegetation and access to many walking and riding trails. Approximately 5,330 net square feet. This is a perfect property for a celebration with friends and family. The large kitchen provided plenty of room for several of us to cook meals together. Seamless access from the kitchen and dining room to the wrap around porch helped make the area for entertaining feel even bigger. The master suite was very large, comfortable and private. All the other rooms were beautifully appointed and maintained as well. Located in a quiet valley, the house has breathtaking views of the mountains from two of the upstairs bedrooms. It's conveniently located, very close to the quiet village of Tesuque, but only a 10 minute drive to reach Santa Fe in one direction or to the Santa Fe Opera in another. Whenever we had any questions or a maintenance issue, the Casa de Santa Fe staff responded very promptly. Our two weeks at Casa de Teresita went by much too quickly. It was a wonderful experience. My experience with Casas de Santa Fe was pleasant and effortless from beginning to end. The staff was more than friendly and accommodating during the booking process and when picking up the keys. 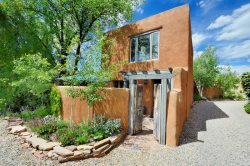 Casas de Santa Fe will be my first choice in looking for accommodations on my next trip to Santa Fe. I highly recommend them for Santa Fe accommodations.